This is a wondrous destination for tourists to visit. But it’s the kind of place in which you definitely don’t want to overstay your welcome. As the sign on the parking curb notes, visitors to the Masaya Volcano in Nicaragua better be prepared to leave in a hurry. The volcano constantly spews out a steady stream of sulfur-laden gas. Fiercer eruptions are not uncommon. 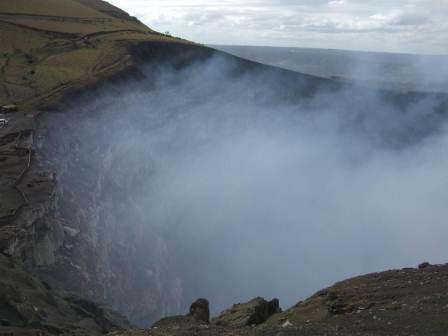 In 2001 the crater on the other side of the ledge exploded, sending huge rocks up to the surface. Vehicles in the parking lot were damaged and one person was injured. The volcano erupted more recently in 2008. Masaya is Nicaragua’s largest national park and is just a 30-minute drive south of the capital city of Managua. 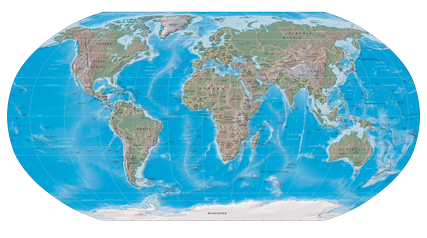 The park includes two volcanoes and five craters. It’s actually the only volcano in the Western Hemisphere where you can drive right up to the rim. Fortunately, on the day that I visited, the only material that rose from the core of the active Santiago crater was foul-smelling smoke. But it was comforting to have our tour van parked just a few feet away – with its front facing the exit — just in case. Some of the most enriching travel experiences happen due to serendipity. 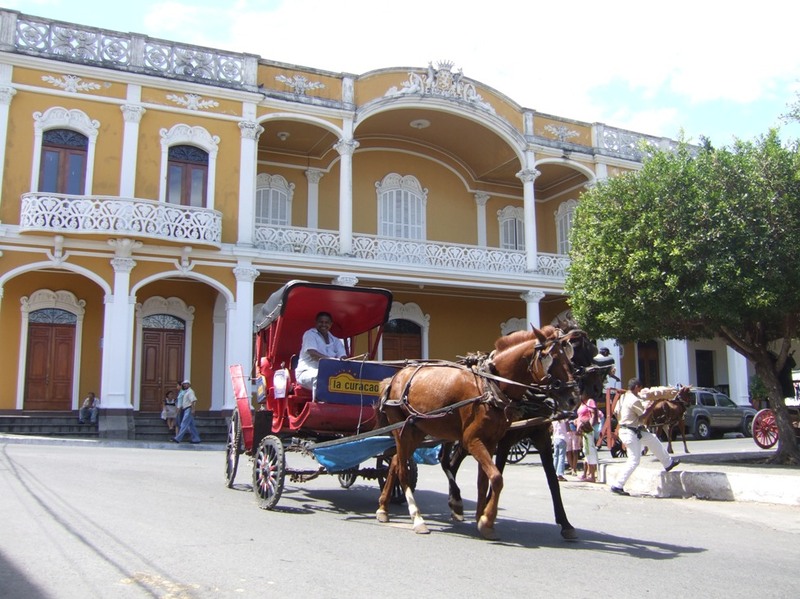 A few years ago I visited the historic colonial town of Granada, Nicaragua. My visit just happened to coincide with an international poetry festival. I’m not a poetry buff, and even if I were, most of the events associated with the festival were conducted in Spanish. No hablo español. But there was one event that spoke to me profoundly in a language I could understand. The festival was culminated by one of the most magnificent and resplendent parades I have ever seen. It seemed like all of Granada – a town of about 90,000 people – turned up to either march or watch the parade. I didn’t understand the meaning behind some of the exhibits and costumes, but I was told later that much of it had to do either with poking fun at the Spanish – who ruled Nicaragua until it gained its independence in 1821 – or honoring the country’s indigenous culture. 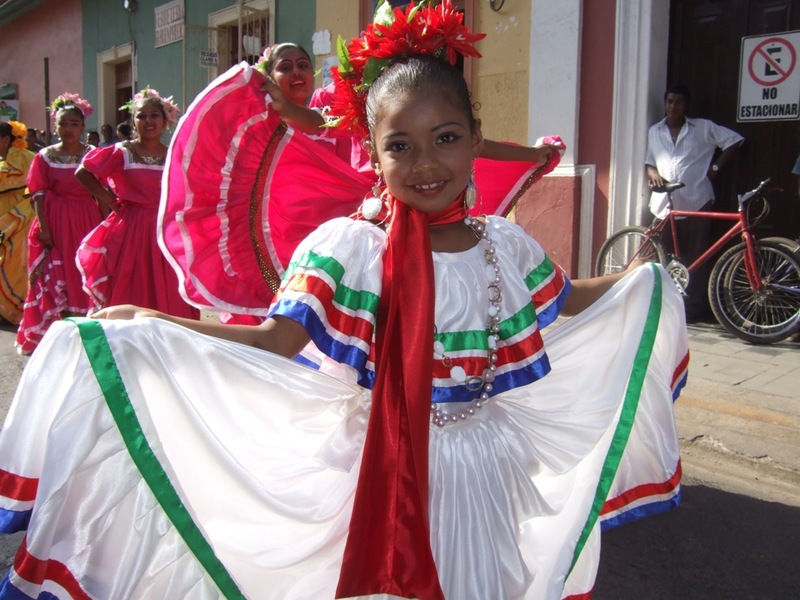 This young lady, proudly displaying her brightly colored folkloric dress, caught my attention. And she didn’t seem shy about posing for a picture. It’s a lovely reminder of what was one of the highlights of a fascinating trip to Central America. 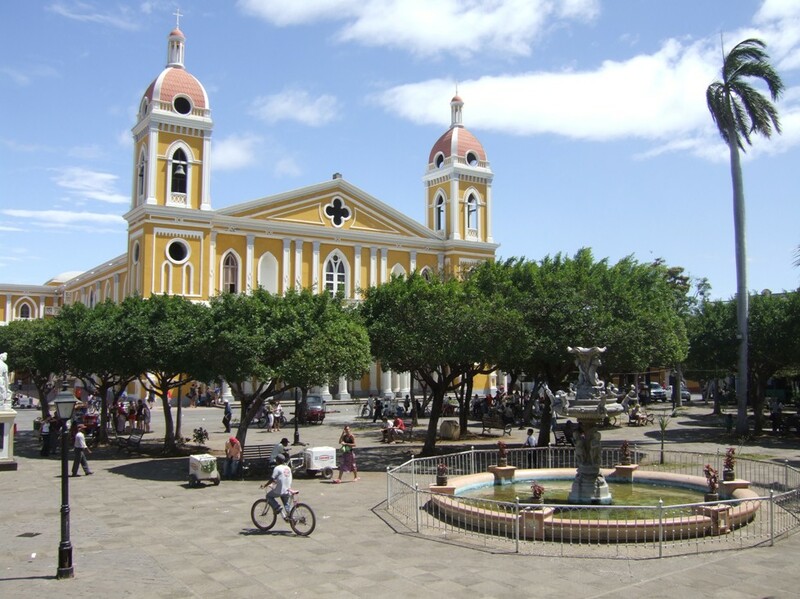 GRANADA, Nicaragua-A country known more for Sandinistas, Cold War politics, natural disasters and the second-lowest per capita income in the Western Hemisphere, has quietly become one of Central America’s safest, cheapest and most intriguing travel destinations. While it may not have the tourism infrastructure of neighboring Costa Rica, the Mayan ruins of Guatemala, or the beaches and water sports of Belize, Nicaragua does offer an impressive array of volcanoes, lakes and charming colonial cities. Travelers are starting to take notice. The country’s budding tourism industry has reported a 70 percent jump in visitors over the past seven years. Most tourists spend at least part of their time in Granada, only a 45-minute drive southeast from the capital city of Managua. Founded in 1524, Granada has the distinction of being the oldest colonial city in the Americas. 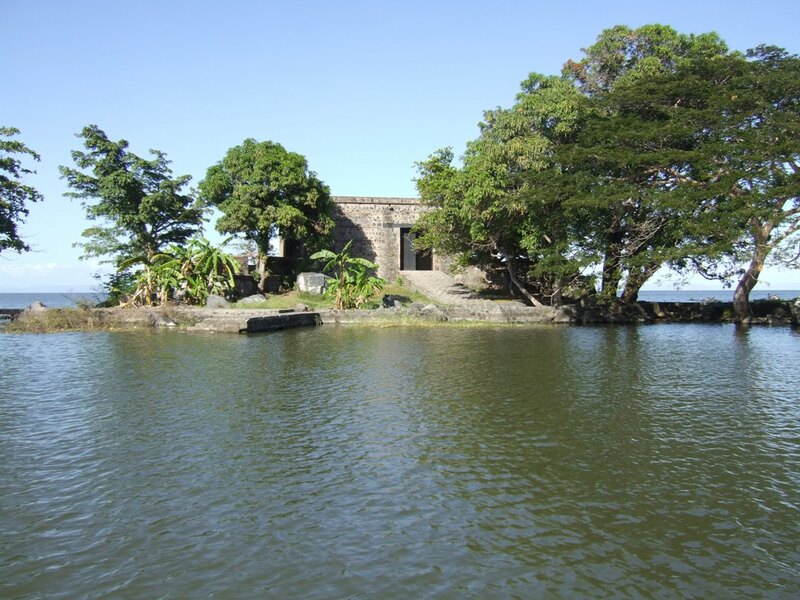 Its location on the western shore of Lake Nicaragua, which feeds into the Atlantic Ocean through the Rio San Juan, has made it an important shipping port to Europe. Granada is full of colorful and architecturally interesting colonial homes and churches on cobblestone streets shared by cars, bicycles and horse-drawn carriages. The heart of the city is its central park, called the Parque Colon, lined with mango trees and flanked on the east by the massive neoclassical Catedral de la Asuncion. The original cathedral on the site was burned down in 1857 by American mercenary William Walker, who ruled Nicaragua for nearly two years. When he was finally driven out by Central American forces, Walker ordered Granada to be burned down. Much of the city was destroyed, and it wasn’t until 1915 when the new cathedral was completed. The Walker episode began a period of war and political upheaval that has been as much a staple of Nicaragua’s turbulent history as rice and beans are in the local diet. The country was ruled by the notoriously corrupt Somoza family from 1935 to 1979, when a popular revolution led by the Sandinista National Liberation Front put Daniel Ortega in power, first as junta leader, then as an elected president. The leftist Sandinistas allied with Cuba and the Soviet Union, leading the United States to provide military support to Somoza supporters known as the Contras (remember the Iran-Contra scandal in the mid-80s involving the Reagan administration and Oliver North?) Civil war ravaged the country during the 1980s before Nicaraguans voted in a right-wing government in 1990. That began a 17-year period of relative calm and the beginning of a Nicaraguan tourism industry. In 2007 Ortega became president again after winning just 38 percent of the vote, but he’s toned down the anti-U.S. rhetoric — President Bush even called to congratulate him on his victory — and he assured the business community that he won’t undo the economic reforms made after the first Sandinista tenure. Still, there are numerous billboards of Ortega throughout the country, with the revolutionary slogan “Arriba los pobres del mundo!” (“Rise up, poor people of the world!”) Conservative Granada has never been known as being pro-Ortega and I noticed that the billboard on the outskirts of town was defaced with paint. I mentioned that to Victor Chamorro, the owner of the Hotel Terrasol in Granada, a 10-room boutique hotel where I stayed for five nights. That began an interesting discussion about Nicaraguan politics with Chamorro, who grew up in Nicaragua and later spent 27 years working as a chef in California before moving back to Nicaragua last year to open up the hotel with his wife Katya. 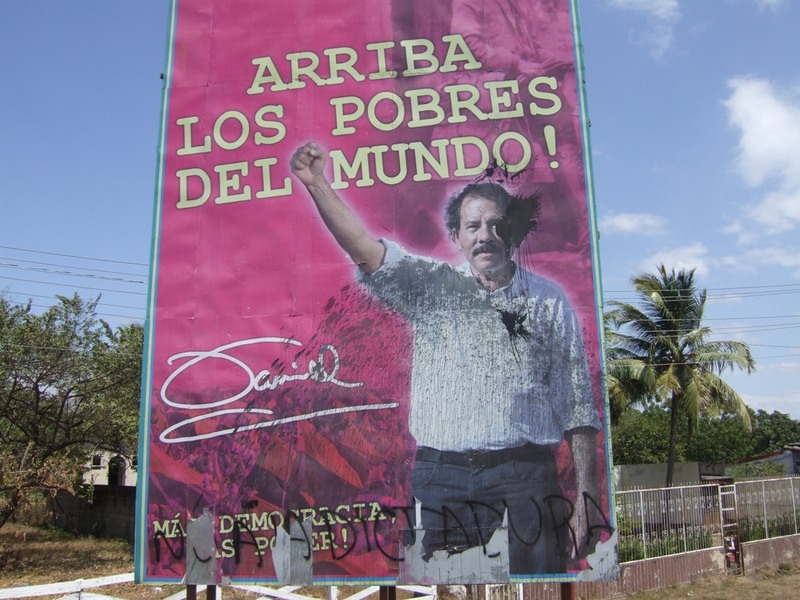 Other than the billboards, tourists will see few signs of Nicaragua’s recent political turmoil. Instead, there is plenty of natural beauty on which to focus, including Lake Nicaragua — known locally as Lago de Nicaragua — the 10th-largest freshwater lake in the world. During a two-hour boat trip on the lake, we glided past some of the 300 tiny islands known as Las Isletas that were created when the nearby Mombacho Volcano erupted 20,000 years ago. Some of the islands are privately owned and have huge mansions. Others have small hotels and restaurants. We stopped at one island that has the remnants of an 18th century Spanish fort, El Castillo San Pablo, which was built to help defend Granada against pirate raids. Another island we visited was inhabited only by monkeys, who hung on to the ends of branches while grabbing bananas from our hands that we had brought on the trip. There are two volcanoes near Granada that make interesting daytrips. My favorite was the Masaya Volcano, Nicaragua’s most visited national park, which is located halfway between Granada and Managua. Even though Masaya hasn’t had a major eruption since 1852, one of its four craters — Santiago — still spews out a steady stream of sulfur gas. 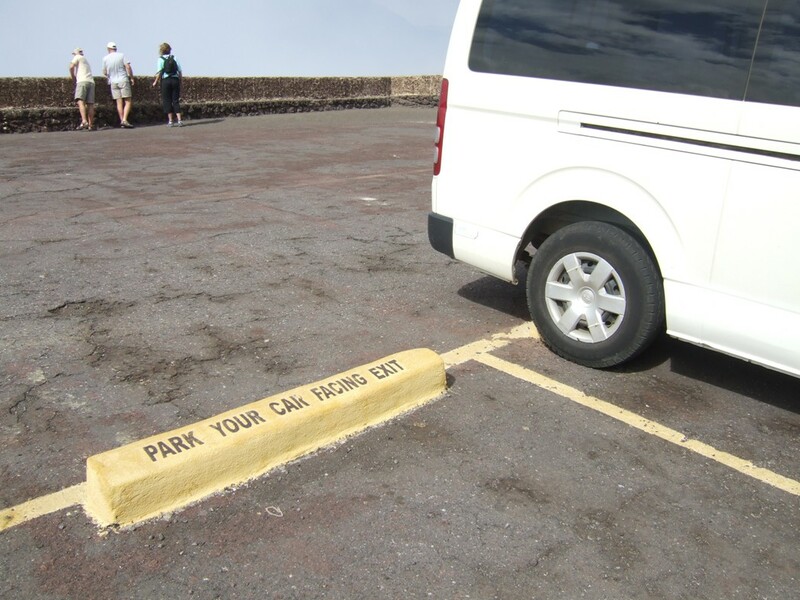 As you drive up to the lookout point near the crater, a sign warns you to park with the front of the vehicle facing the exit. Fortunately, a quick get-away wasn’t needed during our visit, but a few of us on the tour had occasional coughing fits from the sulfur as we hiked around the park. The dormant Mombacho Volcano, with a thick rain forest, is a much different experience. To get to the top of the mountain, which is 4,440-feet above sea level, you ride a 20-seat four-wheel-drive truck up a steep, bumpy road, passing coffee plantations along the way. At the top of Mombacho, it’s about 25 degrees cooler. There are walking trails and, for the more adventurous, a canopy tour where you glide through the trees on cables wearing a body harness. The views at the top of Granada and Lake Nicaragua are amazing. Nicaragua is one of the most inexpensive countries I’ve visited. A full-day tour to Masaya and surrounding towns with English-speaking guide cost $30, most taxi rides cost a buck or two, a good dinner can be had for about 140 cordobas ($7), and a bottle of the local beer — Tona or Victoria — is less than $1. The Hotel Terrasol, just a five-minute walk from central park, was clean, comfortable and cost only $46 a night, including taxes and breakfast. It would have been $10 a night cheaper had I chosen to use my room’s fan instead of the air conditioner, but that would have been uncomfortable as high temperatures reached the low 90s most days. I happened to be in Granada during a week-long international poetry festival. There were poetry readings, concerts in the park and a huge Carnivalesque parade that snaked its way down Calle Real Xalteva, the main drag in town. Marchers wore colorful costumes, some with Halloween-like masks, while they gyrated to music. Even with all of the visitors in town for the festival, Granada never seemed crowded. I ran into a few Americans and Canadians on tours or at restaurants, but left with the feeling that I had a found a culturally vibrant, scenic and affordable destination with plenty to see and do that was still relatively undiscovered by tourists. As word gets out about Nicaragua’s charms, though, it likely won’t remain that way much longer.